Time to sell your Points South condo? Read about today's resort-market condo buyer. The spacious condos at Points South are ideal for families and groups of friends visiting the beautiful area of Gulf Shores, Alabama. These condos all have four bedrooms and four bathrooms with a luxurious Jacuzzi tub in the master bathroom. Fully-equipped kitchens and a washer and dryer in the unit provide guests and owners with all the comforts of home while the breathtaking views of the Gulf of Mexico add a special charm to the condo that you can only find along the stunning Emerald Coast. This low-density, four-story mid-rise only has two units on each floor, so guests and owners enjoy a good deal of privacy. Additionally, each unit enjoys a private entrance and private staircase leading from the balcony onto Gulf Shores' famous white-sand beach. While each unit has one private balconies, there are some that enjoy two. Each condo offers a beautiful direct Gulf-front view of the water and sands. 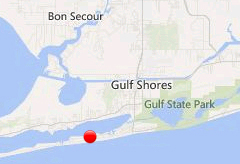 Points South is just minutes from all the of shopping, restaurants, and other attractions that Gulf Shores has to offer. Please email is at info@condoinvestment.com or call (251) Area-Pro (251-273-2776) for immediate assistance or to schedule appointments to view current listings in Points South condominium in Gulf Shores Alabama.